Cathie Filian: 1 Year Anniversary of Hot Glue Gun Helpers and We Are Celebrating With a Giveaway!! 1 Year Anniversary of Hot Glue Gun Helpers and We Are Celebrating With a Giveaway!! We are celebrating the 1 year anniversary of Hot Glue Gun Helpers. 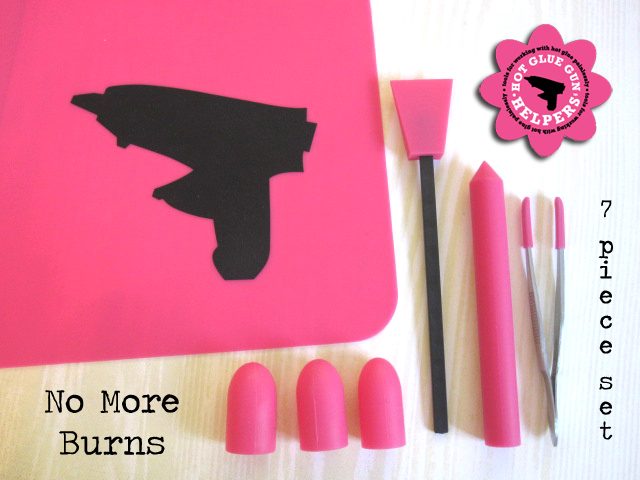 To say thanks for all the support we are giving away 3 sets of tools, 3 pink glue guns from Adtech and 3 finger caps! We feel so blessed by all the support and encouragement from crafters and indie-retailers!! If you are already friend on our new page then leave a comment on this blog post. Tell us a Hot Glue Story or just say hello! Be sure to leave your contact info so we can contact you! Have a peek at the journey! This was stage one of the felt, cardboard and bamboo skewer prototypes. So funny to look back! 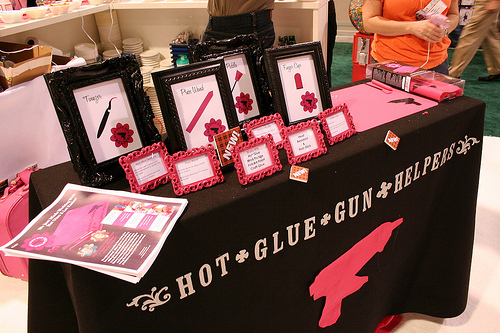 Hot Glue Gun Helpers make their debut at CHA and they were a hit! Crafters were delighted and excited! Round two of the prototypes! Getting Closer!! Our photo shoot for the package! The first box is opened!! Yea! If you want to snag some now, please visit our official shop at etsy. 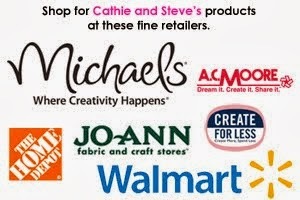 All items are provided by me (Cathie Filian) and are in accordance with the Blogher Rules. To enter: Join our new facebook page or leave a comment to this post telling us a hot glue story. Your comment MUST link to your particular blog or web site or include your e-mail address. Otherwise, I won't be able to get in touch with you if you win! Any entries that do not include some way of getting in touch will be disqualified. Deadline: Comments must be received by midnight Jan 30, 2012. Odds of winning will depend on the number of eligible entries received. I would <3<3<3 to win!!! Ooohhh, I remember entering a year ago? to win this!!! I love it!!! Thanks for the chance. Following your new FB page! PS, I shared on my FB page! I have been admiring these since you debuted them last year! Happy Anniversary to you! Congratulations! I can't believe it's been a year already. I already liked your fb pages. Love you guys! Congratulations on your first year! Hoping for many, many, MNAY more!!! I would LOVE to win this - but then again, who wouldn't??? Hot glue helpers would come in handy around my house. Can't have too many supplies when you make costumes. yay! would love to win this! at work and at home, i am always trying to do too many things at once...actually have to keep burn ointment next to my glue gun. after gluing felt hats on ping pong balls for 50 gnome catapults, my fingers hurt for a couple of days from all the burns. I just liked you on Facebook! Thanks for a great giveaway! This give away looks really exciting! I've been looking for a way not to trail hot glue all over my table (and myself) when I use it. I'm surprised I still have fingerprints, as much as I burn the tips of my fingers on my glue guns. Hi Cathie. I'm friends on both your pages. I could really use the set. I've wanted to get one but none of our local stores carry it. Thanks loads and see you next week at CHA. I hate getting burns from hot glue. Would love to have your Glue Gun Helpers. They aren't available for purchase in my area! Congratulations! Already like your page on FB! I have been wanting to buy a glue gun. This would be great if I could win on!!! Congrats! I've been following you for ages on FB. I would love to win your set! 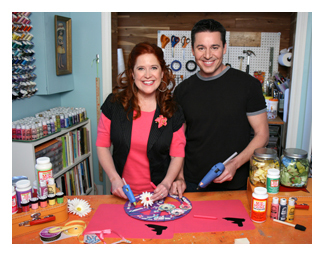 I love to craft with my kids and all the neighborhood kids too and we use my glue guns a lot. This would help those little fingers a lot. Thanks for the chance to win. Thanks for the chance to win....oh, and happy birthday to the Hot Glue Gun Helpers! Hmmm... hot glue. Isn't it just a known fact that you must burn yourself at least once every time the glue gun is on? ;) Thanks for the chance! btw- follower of your new page. Wow, it has seriously already been a year? And to think I still don't have these!! CONGRATS!! Thanks SO much for this giveaway! I avoid my gluegun at all costs just to avoid the burns. Just liked your facebook page. I follow your new FB page :) Thank you for the chance to win. I already follow you on FB. I would LOVE to win a set and save my poor burnt fingers!! You know i love ALL your shows, episodes, specials, pages, and products! I want me some of them there tools! Would love to win this!..thanks! Love watching you guys! Happy Anniversary! I would love to win a set of these. My poor burnt fingers will be forever grateful! I joined the FB page :) this product is so cool! ha ha no pun intended--no, wait, may it is--cause I almost always burn a finger or two! haha! "I got blisters on my Fingers" kinda like John Lennon. Already a friend on your facebook page. I'd love this. congrats. Pink Pink Pink A girl just has to have pink tools!!!! Have a great day!!! Congrats on your first birthday. :) I am already a FB friend. I am from Canada, (could I pay the extra shipping, if I get picked to win??) Well my Hot glue story, it actually happened last night, I was trying to make hot glue gun charms, and touched the charm to see if it was cold enough to move, It wasn't, ouch. I pulled it off of my finger and it stuck to my other finger lol. I am always burning my fingers by being impaitent. Would so love to win one of these prizes. Happy Birthday to a FAB 1 year old!! My 10 fingers will always be grateful if I win this ! I've been burned so many times making rosettes.... it's not fun! This would be perfect for me I use mine all the time with my Daisy Troop. I try to show them how not to get burnt and usually burn myself!! I hope I win... fingers crossed!! how exciting!!! this is certainly something on my wants list for crafty items. i still have a scar on my right hand from when i burnt myself with that silly glue gun of mine! thanks for the chance to win! Really great heat tools! Easy and safe! Hi, I'm so glad I discovered your blog just now! I love crafting. That is very cool, I love it. and yes I love your blog as well. I wish they had more crafting shows on like yours, It seems that there are not any more on and I use to be glued to the tv set. Glad I found your blog for sure. Already a fan Crackle Queen! :) It's a year already?! How time flies! I would love to win one! Congrats and good luck! I love the glue gun helpers. I wish I had enough for all my students in my classes. Is there a bulk pack? I love to use them to make fabric no sew flowers. I liked your page, and I have many stories of being burned by glue gun. Thanks for offering the giveaway. I just recently heard of this product and would love to win one! What a great addition to a craft room!!! So glad Celeste told me about the giveaway, and so glad you are having a giveaway ;) Thanks for the chance to win!!! Hot glue and I go back years. We've shared good times and bad (cheap guns breaking mid project, burns, strings of hot glue out of control!) but it has never stopped being my go to project glue. Where did the year go? Congrats on your anniversary! I have liked your page on FB. These would be great. My son and I love to craft but have never tried hot glue. So this would be an oportunity to try something new. You're one already?! Wow time flies! I love these so much. I can not believe no one ever thought of it before. As many time as people have cursed their glue guns now they are given a new life. I've been a fan of your FB page.... Now my story. My first project using a hot glue gun had more glue strands than one can imagine!!!! I'm a FB fan and I'm been fun of you guys and your show for loong time! I still watch the reruns. Would love to win this! As an art teacher, the glue gun has saved many projects and fixed many kiddos flip flop shoes as well! Thanks for the opportunity! Love your stuff! I just found your site and "liked" you on FB. This is a great idea. No more burned fingers. Thanks!! I've been wanting this since the moment I saw it a year ago! Thanks for the chance to win. What a giveaway!!!!! It is awesome!!!! Thank you so much for the opportunity to win! Having burned myself MANY times on a hot glue gun, this is so AWESOME!!! Would love to win! By the way, I used to love watching you on television - I am really bummed that HGTV doesn't seem to do any craft shows any more. I dont understand that!!! I now like you on Fb. Hot glue guns have always scared me a little. I've never burned myself badly, but I have accidentally touched the hot glue several times. This is a great product for me! I'm always wearing a band-aid or two, along with a few "ouchie" words! If my glue gun isn't used to make some thing new, I'm always pulling it out to fix something to make it new again! PS we could be related or a secret Twin (I would be the older Twin! lol)?